Well, the latest Worldcon is over and life is beginning to return to normal. We had quite a mad lead up to the convention as we had decided to enter some of our pictures in the art show, we did this last minute and were put on a waiting list, then about a month before the convention I got an email saying we had got in. We then panicked when we realised we didn't have enough pictures to fill our allotted space. Images had to be created and in my husband's case, printed out on canvas too. He discovered that our local Staples store does same day canvas printing which saved him. We then found that our business cards were out of date and I did wonder how many other artists were frantically printing out business cards and spraying them with matt varnish in the garden at 10pm, I'm sure our neighbours wondered what was going on. Still, we got it all done and even managed to get some sleep too. Wednesday was an early start, what with packing and then loading the car. We had to do this with time to get to the ferry we had booked, but the Southampton route is quite nice and we prefer it to the two alternatives even though it is longer. A word to the wise here, if you are coming to the island you really do have to book your ferry well in advance, you can't turn up and guarantee getting on one especially in the summer. We got to London without problem and even found our way to the venue without getting lost, a good result! Mind you, we nearly put our pictures back in the car when we saw who we were sharing a bay with in the art show, but Chris Achilleos is a really nice guy and modest too. He put us at our ease and we set up our panel. From not having enough pictures we nearly had too many, I must admit they were well packed in, but the panel did look fairly good when we had finished. Our finished panel in the art show. I must admit the photo isn't the best I've ever taken, but it was the best under the circumstances. The lighting wasn't the best ever, but I think it was the best the organisers could achieve in the location. I don't think good gallery lighting can be achieved in warehouse conditions. Here I would like to say how good the layout of the art show was too, nothing felt cramped and I think people had enough room to stand back and look at the artworks from a proper distance. My memories of the art show in Glasgow in 2005 are of a cramped space with smaller bays, but my memory might be playing tricks on me. Right up until the auction on Sunday it didn't seem that many pieces had sold and I don't recall any with the 6 bids needed for auction. 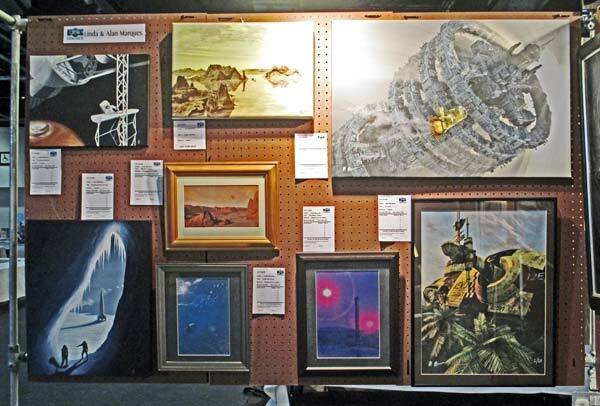 However, I did sell one picture, the purple one bottom centre right in the photograph, called "The Watchtower". It went for £50 and covered the cost of the panel in the show, but sadly my husband didn't sell this time. One of his pictures was runner up in the best in show category in 2005, he sold it too and it went to a good home in Ireland. We did have a lot of good comment though and did chat to a lot of fellow artists, including some of the big names. In particular Fred Gambino was a real star, he wasn't able to finish his talk in the convention, but spent an hour with us on the Sunday going through the remaining part of his talk and showing us how he works. It is nice to meet someone you admire and then find they are even nicer than you hoped. As promised, a quick plug for Fred's latest book, "Dark Shepherd", rush out and buy it. You won't regret it, his artwork is, as always, amazing. What can I say about Worldcon? I think this year's was the best of the three I have been to. There was always something interesting to go and see or do, often late into the night too, and that didn't include the bar. Yes, there were a few problems, given the size of the event I would be surprised if there weren't. Overall though it was a thoroughly enjoyable experience. It did take several days to recover from the early starts and late finishes though, I guess the passing years are beginning to tell. I just hope either Finland gets the 2017 worldcon (I'm hoping for a trip to Moominland! ), and/or Dublin gets the 2019 one. If they do I will be going, even if I have to sell the furniture to do it!